Mom took the Fabric Challenge Quilts down to the Quilt Show in Troy, PA this past weekend. We got lots of votes in the ballot bucket. But we want to fill it even more! We will have the Fabric Challenge Wall Hangings on display, here at the Shop until Friday, May 20th. 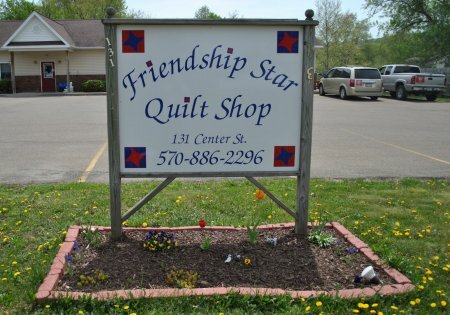 So, if you didn't or even if you did stop to vote for your favorite Fabric Challenge Wall Hanging, stop in to see and vote for your favorite wall hanging between now and Friday, May 20th. They are all beautiful and I give all of them 4 paws! I think they are all Winners. Don't forget to mark your calendars because this Saturday, May 14th from 10a-11a is our Free Pattern & Demo Day! We will have coffee, tea or water to drink. Plus some tasty goodies to munch on. Stop in Saturday morning and start your weekend hanging out with the girls (and me), learn about a new pattern.